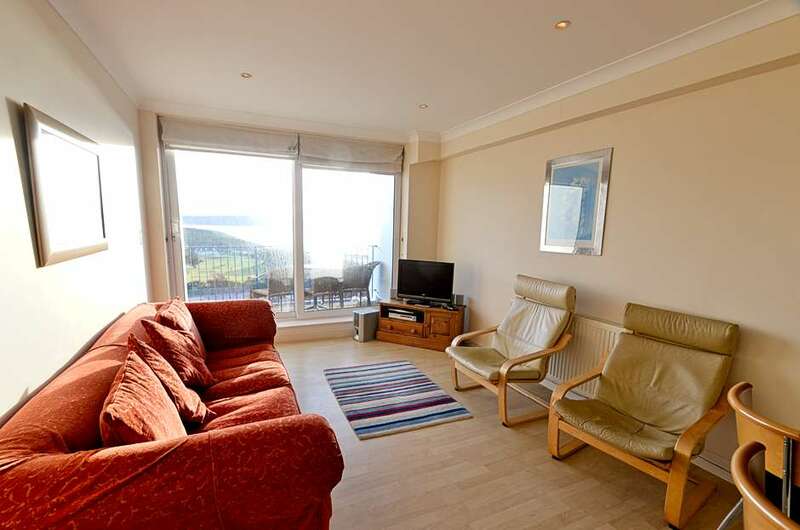 Centrally located, 3 large sea view balconies and just across from Woolacombe Beach, perfect! This wonderful apartment is situated in the heart of the village with 2 spacious bedrooms and commands spectacular views over Woolacombe Bay across the beach towards Baggy Point and out to sea. The open plan living area has comfortable seating with TV, DVD, CD/Radio player and Free WiFi Broadband while the modern kitchen has a breakfast bar for informal dining. The kitchen (newly fitted for 2019) area is well equipped with a large fridge/freezer, cooker with double oven, microwave, dishwasher and washing machine with built in dryer. The master bedroom is en-suite with a king size bed, the twin room has a separate bathroom and there is a spacious hall area with table and chairs, books, puzzles and games. A travel cot and highchair are also available for guest's use. Both bedrooms and living area have huge patio doors and all three lead onto private balconies from where you can enjoy the ever changing coastal scene. There is plush carpet to the master bedroom and newly laid laminate flooring in the 2nd bedroom (not yet shown in the photos). This is a perfect holiday base for any time of year. Just yards from the beach, it is ideal for families and surfers as well as those who enjoy walking and exploring Exmoor, North Devon and Cornwall.